Payment Instructions: Internet and BUYERS PREMIUM is a combined 15% and a 3.8% convenance fee if paid with a credit card ... (760)954-9964 All prospective buyers must be at least 18 years old and are required to register with I-15 Auction prior to bidding. By using the bid number, the bidder acknowledges he has received, read, and understands and agrees to be bound by the terms and conditions of the auction either on the bidders agreement or posted at the auction facility or online. The bidder offering the highest bid accepted by the Auctioneer shall be the purchaser of the offered lot, and no purchaser shall retract his bid. Purchaser accepts a lot when he makes a bid. All sales are final. The bidder, whether acting as principal, agent, officer or director of a company or otherwise, in any capacity whatsoever, and the company he represents, both jointly and severally agrees to indemnify and save harmless Auctioneer and its officers, directors, employees, agents, attorneys and its consignors, from any and all actions, causes of action, suits, damages, costs, and losses of any nature, including injury and death, arising from the purchase or use of any items, or the attendance or participation of bidder, his/her agents or employees, at the auction and/or on the auction site whether before, during, or after the auction. Bidder agrees to be responsible for the payment of the purchase price, Auctioneer's fees, any applicable DMV fees, and taxes due on all of bidder's purchases. The Auction Terms and Conditions shall be governed by and interpreted under the laws of the State of California, and any action hereunder against Auctioneer shall be commenced in the State of California .I-15 Auctions, INC AND SELLERS MAKE NO, AND EXPRESSLY DISCLAIM ANY, GUARANTEE, WARRANTY OR REPRESENTATION, EXPRESSED OR IMPLIED, TO YOU WITH RESPECT TO ANY ITEM, INCLUDING WITHOUT LIMITATION, CONDITION, MERCHANTABILITY, QUALITY, RARITY, IMPORTANCE, FITNESS FOR A PARTICULAR PURPOSE, HISTORICAL RELEVANCE OR OTHERWISE. Descriptions are just a guide and all auctions offer a preview.. All items are sold AS IS-WHERE IS without any guarantees or warranty expressed or implied, statutory or otherwise of any nature whatsoever in respect of the lots offered at the auction. Specifically, but without limitation, Bidders are encouraged to make their own physical inspection and rely solely on that inspection before bidding. Failure to inspect does not negate that Bidders responsibility to perform under the auction terms and conditions. The Bidder acknowledges that all auction items are available for inspection prior to the auction and it is the Bidders responsibility to have inspected the item before bidding. No sale shall be invalidated; nor shall Auction company be liable as a result of defects or inaccuracies of any lot. Any dispute arising as to any bidding shall be settled by I-15 Auctions, Inc at their sole discretion, and I-15 Auctions, Inc may put the lot in dispute up for sale again. I-15 Auctions, Inc reserves the right to refuse any bid, which it considers to be an insignificant advance over the preceding bid. No person shall bid on any lot of which he is the Consignor, agent, associate, or on behalf of the Consignor. The purchaser shall pay a non-refundable deposit of 25% of the purchased price of any auction lot on the date of the auction, with the balance of the purchase price paid within 2 days following the auction. All payments must be received by cashiers check, money order, or wire transfer payable to I-15 Auction. Credit cards are accepted. Any payment other than cash may be subject to an additional 3.8% administrative fee. State and local sales tax will be assessed and collected on all purchases unless legal exemption documentation is provided at the time of sale. A Buyers Premium will be added to the bid price of each item purchased unless otherwise noted. Purchaser is responsible for insuring his purchases immediately. I-15 Auction shall not be responsible for loss, damage, or theft of any purchase. Purchaser shall not be entitled to remove any item form the auction facility until all his purchases are paid for in full including all applicable goods, sales or use taxes. Removal of all items shall be the sole responsibility of the purchaser. Loading assistance/shipping is provided as a extra fee to the purchaser and is the sole responsibility of the purchaser. Purchaser assumes all risk and responsibility for loading and removal of purchases. All items must be removed from the auction facility within 3 days after the auction date. If for any reason purchaser fails to remove any purchase within the time specified, the purchase shall be deemed abandoned, and Auctioneer at its sole discretion may resell the items. Purchaser shall be liable for any rent incurred or damages suffered by Auctioneer because of purchaser's failure to remove any item. Failure to remove items will result in a rental / storage fee of not less than $25 per item per day. Shipping is provided at buyers expense and must be paid for within 48 hours of receiving your shipping quote or items will be considered abandoned. I-15 Auctions, Inc will resale the items. ALL FIREARMS WILL BE SOLD BY I-15 Auctions, inc a Federal Firearms License (FFL) Licensee in California. California BUYERS-Must pass the California Bureau of Investigations background check for all firearms. A $35 fee will be charged for the background check. If you do not pass the background check, you still must pay for the firearm(s), and they will be sold at a later auction and appropriate commission will be charged. Guns must be picked up by the purchaser at I-15 Auctions. No one but the purchaser may pick up firearm .. BUYERS FROM OUTSIDE CALIFORNIA OR OUT OF AREA BUYERS- IMMEDIATELY FOLLOWING THE AUCTION YOUR CREDIT CARD WILL BE CHARGED FOR YOUR PURCHASES AND BIDDING FEE'S. YOU ARE REQUIRED TO Contact a Federally licensed firearm dealer in your state who will accept shipment and transfer the firearm to you in your state. YOU ARE RESPONSIBLE TO DETERMINE YOUR ABILITY TO PURCHASE A FIREARM IN YOUR STATE. IF YOU FAIL TO QUALIFY IN YOUR STATE YOU WILL THEN OWN A WEAPON THAT YOU CAN'T POSSESS. ALL SALES ARE ABSOLUTELY FINAL ON THE DAY OF SALE. I-15 Auctions will arrange shipping on all firearms through a local pack/ship company or a national company of your choice. The cost of the shipping will be paid by the purchaser prior to shipment. HANDGUN'S REQUIRE OVERNIGHT SHIPPING. Visa, Master Card and American Express are accepted for payment. YOU MUST BE OVER 21 YEARS OLD TO BUY LONG GUNS. YOU MUST BE OVER 21 YEARS OLD TO BUY HANDGUNS ATF FORMS WILL BE FILLED OUT ON ALL GUNS, with the exception of pre 1898 antique's. A $70.00 document processing fee, $55 smog fee, and registration fee (if applicable) will be charged for every DMV purchase, whether sold independently or grouped into one Lot and regardless of purchaser's intended use of the purchase. California law does not provide for a cooling off or other cancellation period for vehicles. Therefore you cannot later cancel a contract simply because you change your mind, decide the vehicle costs too much, or wish you had acquired another vehicle. I-15 Auction must offer a 2-day cancellation option, should you wish to exercise, to purchase the right to return certain motor vehicles under $40,000 by 5 pm of the second day after the sale. This cancellation option applies only to vehicles purchased for personal or household use; it does not apply to motorcycles, off-road vehicles, recreational vehicles, or vehicles sold for business or commercial use. In order to exercise this option you must inform I-15 Auction at the time of purchase on that specific auction day. The cost for purchasing this cancellation option is as follows: Purchase Price Cost of Option Restocking Fee $0-$5,000: $75- $100; $5,000-10,000, $150-$200; $10,001- 30,000, $250-$300, $30,001- 40,000 $400-$500. The amount is non-refundable and the purchaser will also be charged a additional restocking fee. The vehicle must be returned in same condition and the mileage must not exceed the (250) permitted miles otherwise the option is void. Funds must be certifiable prior to the processing or release of DMV documents. Documents will be prepared to be effective only in the jurisdiction in which the auction is being conducted. If for any reason,I-15 Auctions, Inc is unable to make available or deliver any purchase or clear title to the same, or documentation required in respect of any purchase, whether before or after delivery, I-15 Auctions, Inc sole liability shall be the return of monies paid in respect of such purchase upon its return by purchaser. Any such purchase shall be returned or surrendered upon demand by Auctioneer. Some vehicles may be sold pursuant to vehicle code 24007.5, subsection (a) paragraph (2) and may only be available to licensed motor vehicle dealers and dismantlers. 23.Diesel vehicles (over 14,400 GVW) or off-road diesel equipment / vehicles when operated in California may be subject to the State of California Air Resource Board (CARB) in-use off-road diesel vehicle regulation or accelerated turnover requirements to reduce emissions or air pollutants and may not be operated or registered in the State of California without being retro-fitted. This vehicle/equipment may or may not be identified by I-15 Auction. It is the buyer's sole responsibility to determine if diesel engines or equipment with diesel engines can be permitted or registered in the State of California. For more information contact the (CARB) www.arb.ca.gov/msprog/ordiesel/ordiesel.html. www.arb.ca.gov/msprog/ordiesel/ordiesel.html. Bidders purchasing Out-of-State items must be registered as an out of State buyer with I-15 Auction prior to bidding. Bidders are hereby notified that a VIN Stop has been filed with California DMV prohibiting the vehicle/equipment from being registered in California. Purchaser will be required to sign an ARB Out-of-State Verification Form acknowledging their intent to move the vehicle/equipment out of California, and an Out-of-State Sales Agreement indicating that the Buyer will inform future buyers that the vehicle cannot be registered and operated in California unless compliant with Section 2022.1(b). Checkout Date & Times: Check-out is April 29 and 30 from 9:30am-5pm. We welcome pick up on the auction!! Shipping can be arranged. All prospective buyers must be at least 18 years old and are required to register with I-15 Auction prior to bidding. By using the bid number, the bidder acknowledges he has received, read, and understands and agrees to be bound by the terms and conditions of the auction either on the bidders agreement or posted at the auction facility or online. The bidder offering the highest bid accepted by the Auctioneer shall be the purchaser of the offered lot, and no purchaser shall retract his bid. Purchaser accepts a lot when he makes a bid. All sales are final. There is a 25% restocking fee if terms are not met. The bidder, whether acting as principal, agent, officer or director of a company or otherwise, in any capacity whatsoever, and the company he represents, both jointly and severally agrees to indemnify and save harmless Auctioneer and its officers, directors, employees, agents, attorneys and its consignors, from any and all actions, causes of action, suits, damages, costs, and losses of any nature, including injury and death, arising from the purchase or use of any items, or the attendance or participation of bidder, his/her agents or employees, at the auction and/or on the auction site whether before, during, or after the auction. Bidder agrees to be responsible for the payment of the purchase price, Auctioneer's fees, any applicable DMV fees, and taxes due on all of bidder's purchases. The Auction Terms and Conditions shall be governed by and interpreted under the laws of the State of California, and any action hereunder against Auctioneer shall be commenced in the State of California .I-15 Auctions, INC AND SELLERS MAKE NO, AND EXPRESSLY DISCLAIM ANY, GUARANTEE, WARRANTY OR REPRESENTATION, EXPRESSED OR IMPLIED, TO YOU WITH RESPECT TO ANY ITEM, INCLUDING WITHOUT LIMITATION, CONDITION, MERCHANTABILITY, QUALITY, RARITY, IMPORTANCE, FITNESS FOR A PARTICULAR PURPOSE, HISTORICAL RELEVANCE OR OTHERWISE. Descriptions are just a guide and all auctions offer a preview.. All items are sold AS IS-WHERE IS without any guarantees or warranty expressed or implied, statutory or otherwise of any nature whatsoever in respect of the lots offered at the auction. Specifically, but without limitation, Bidders are encouraged to make their own physical inspection and rely solely on that inspection before bidding. Failure to inspect does not negate that Bidders responsibility to perform under the auction terms and conditions. The Bidder acknowledges that all auction items are available for inspection prior to the auction and it is the Bidders responsibility to have inspected the item before bidding. No sale shall be invalidated; nor shall Auction company be liable as a result of defects or inaccuracies of any lot. Any dispute arising as to any bidding shall be settled by I-15 Auctions, Inc at their sole discretion, and I-15 Auctions, Inc may put the lot in dispute up for sale again. I-15 Auctions, Inc reserves the right to refuse any bid, which it considers to be an insignificant advance over the preceding bid. No person shall bid on any lot of which he is the Consignor, agent, associate, or on behalf of the Consignor. The purchaser shall pay a non-refundable deposit of 25% of the purchased price of any auction lot on the date of the auction, with the balance of the purchase price paid within 2 days following the auction. All payments must be received by cashiers check, money order, or wire transfer payable to I-15 Auction. Credit cards are accepted. Any payment other than cash may be subject to an additional 3.8% administrative fee. State and local sales tax will be assessed and collected on all purchases unless legal exemption documentation is provided at the time of sale. A Buyers Premium will be added to the bid price of each item purchased unless otherwise noted. Purchaser is responsible for insuring his purchases immediately. I-15 Auction shall not be responsible for loss, damage, or theft of any purchase. Purchaser shall not be entitled to remove any item form the auction facility until all his purchases are paid for in full including all applicable goods, sales or use taxes. Removal of all items shall be the sole responsibility of the purchaser. Loading assistance/shipping is provided as a extra fee to the purchaser and is the sole responsibility of the purchaser. Purchaser assumes all risk and responsibility for loading and removal of purchases. All items must be removed from the auction facility within 3 days after the auction date. If for any reason purchaser fails to remove any purchase within the time specified, the purchase shall be deemed abandoned, and Auctioneer at its sole discretion may resell the items. Purchaser shall be liable for any rent incurred or damages suffered by Auctioneer because of purchaser's failure to remove any item. Failure to remove items will result in a rental / storage fee of not less than $25 per item per day. Shipping is provided at buyers expense and must be paid for within 48 hours of receiving your shipping quote or items will be considered abandoned. I-15 Auctions, Inc will resale the items. ALL FIREARMS WILL BE SOLD BY I-15 Auctions, inc a Federal Firearms License (FFL) Licensee in California. California BUYERS-Must pass the California Bureau of Investigations background check for all firearms. A $35 fee will be charged for the background check. If you do not pass the background check, you still must pay for the firearm(s), and they will be sold at a later auction and appropriate commission will be charged. Guns must be picked up by the purchaser at I-15 Auctions. No one but the purchaser may pick up firearm .. BUYERRS FROM OUTSIDE CALIFORNIA OR OUT OF AREA BUYERS- IMMEDIATELY FOLLOWING THE AUCTION YOUR CREDIT CARD WILL BE CHARGED FOR YOUR PURCHASES AND BIDDING FEE'S. YOU ARE REQUIRED TO Contact a Federally licensed firearm dealer in your state who will accept shipment and transfer the firearm to you in your state. YOU ARE RESPONSIBLE TO DETERMINE YOUR ABILITY TO PURCHASE A FIREARM IN YOUR STATE. IF YOU FAIL TO QUALIFY IN YOUR STATE YOU WILL THEN OWN A WEAPON THAT YOU CAN'T POSSESS. ALL SALES ARE ABSOLUTELY FINAL ON THE DAY OF SALE. I-15 Auctions will arrange shipping on all firearms through a local pack/ship company or a national company of your choice. The cost of the shipping will be paid by the purchaser prior to shipment. HANDGUN'S REQUIRE OVERNIGHT SHIPPING. Visa, Master Card and American Express are accepted for payment. YOU MUST BE OVER 21 YEARS OLD TO BUY LONG GUNS. YOU MUST BE OVER 21 YEARS OLD TO BUY HANDGUNS ATF FORMS WILL BE FILLED OUT ON ALL GUNS, with the exception of pre 1898 antique's. A $70.00 document processing fee, $55 smog fee, and registration fee (if applicable) will be charged for every DMV purchase, whether sold independently or grouped into one Lot and regardless of purchaser's intended use of the purchase. California law does not provide for a cooling off or other cancellation period for vehicles. Therefore you cannot later cancel a contract simply because you change your mind, decide the vehicle costs too much, or wish you had acquired another vehicle. I-15 Auction must offer a 2-day cancellation option, should you wish to exercise, to purchase the right to return certain motor vehicles under $40,000 by 5 pm of the second day after the sale. This cancellation option applies only to vehicles purchased for personal or household use; it does not apply to motorcycles, off-road vehicles, recreational vehicles, or vehicles sold for business or commercial use. In order to exercise this option you must inform I-15 Auction at the time of purchase on that specific auction day. The cost for purchasing this cancellation option is as follows: Purchase Price Cost of Option Restocking Fee $0-$5,000: $75- $100; $5,000-10,000, $150-$200; $10,001- 30,000, $250-$300, $30,001- 40,000 $400-$500. The amount is non-refundable and the purchaser will also be charged an additional 25% restocking fee. The vehicle must be returned in same condition and the mileage must not exceed the (250) permitted miles otherwise the option is void. Funds must be certifiable prior to the processing or release of DMV documents. Documents will be prepared to be effective only in the jurisdiction in which the auction is being conducted. If for any reason,I-15 Auctions, Inc is unable to make available or deliver any purchase or clear title to the same, or documentation required in respect of any purchase, whether before or after delivery, I-15 Auctions, Inc sole liability shall be the return of monies paid in respect of such purchase upon its return by purchaser. Any such purchase shall be returned or surrendered upon demand by Auctioneer. Some vehicles may be sold pursuant to vehicle code 24007.5, subsection (a) paragraph (2) and may only be available to licensed motor vehicle dealers and dismantlers. 23.Diesel vehicles (over 14,400 GVW) or off-road diesel equipment / vehicles when operated in California may be subject to the State of California Air Resource Board (CARB) in-use off-road diesel vehicle regulation or accelerated turnover requirements to reduce emissions or air pollutants and may not be operated or registered in the State of California without being retro-fitted. This vehicle/equipment may or may not be identified by I-15 Auction. It is the buyer's sole responsibility to determine if diesel engines or equipment with diesel engines can be permitted or registered in the State of California. For more information contact the (CARB) www.arb.ca.gov/msprog/ordiesel/ordiesel.html. www.arb.ca.gov/msprog/ordiesel/ordiesel.html. Bidders purchasing Out-of-State items must be registered as an out of State buyer with I-15 Auction prior to bidding. Bidders are hereby notified that a VIN Stop has been filed with California DMV prohibiting the vehicle/equipment from being registered in California. Purchaser will be required to sign an ARB Out-of-State Verification Form acknowledging their intent to move the vehicle/equipment out of California, and an Out-of-State Sales Agreement indicating that the Buyer will inform future buyers that the vehicle cannot be registered and operated in California unless compliant with Section 2022.1(b). 2003 Komatsu WA500-3 Loader, Tight Machine. 4x4 Ready To Go To Work! CWS Rock Bucket, See Video! 2009 4x4 John Deere 710J Backhoe with 18", 24", 35", 48" Buckets & compaction Wheel, See Video!! Tight Machine and ready to go to work!! 1994 John Deere 690D Excavator with Two Buckets, See Video!! 1991 International 2000gal Water Truck with Cummins Diesel and Manual Trans, See Video! VIN: 1HSHBGEN9MH343303 88,883 hours New front tires! SE Plates, sold on application for SE plates only. VIN: 1GCHC29234E285120 Mileage: 205,830 Hours: 6541 Cold A/C! Power windows, seats and mirrors. Leather interior with heated front seats. Bose sound system with Kenwood navigation unit and back up camera. Prodigy brake controller. New batteries! BF Goodrich tires all around! Brand new engine and fuel system. both with 1 year warranty. 8" Pro Comp lift with King shocks front and year. New 24" Wheels and 37" tires. $5,000 stereo system with navigation. Mag-Hytec trans pan and rear diff cover. Amp Research Power steps and Banks power system. 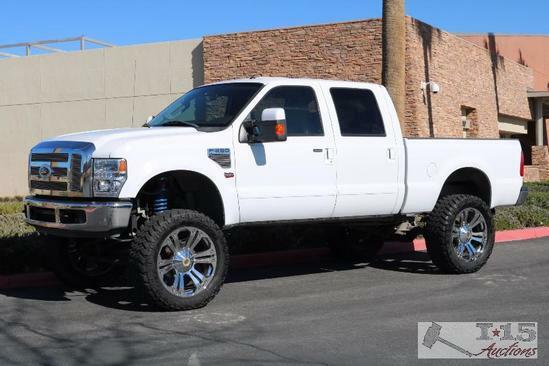 2008 Ford F-450 Super Duty Lariat 6.4L Turbo Diesel 4...4 Dually, See Video! 1999 Ford F-350 Super Duty Long Bed 7.3L Turbo V8 Power Stroke 4...4, See Video! You've been outbid by h****g! by YOU! 2006 Dodge Ram 2500 Heavy Duty 5.9L Cummins Diesel 4x4 Short Bed, See Video! 1951 Ford Deluxe Club Coupe with Flathead V8, See Video! VIN: B1LB106278 Owner has had it for 32 years!! California car!! Baby Blue paint. Owner has had the car since 1987 feels confident that it is the actual mileage 60,943. Club coupe and unique no back seat used for salesman. Reupholstered with the original fabrics. New brakes we have all repair invoices !! Kept it well maintained !! Tail pipe recently redone, CA Clean title on non op. California RUST FREE CAR.. good tires with original spare tire with extra hub cap. You've been outbid by X****1! by YOU! 2005 Cadillac DHS with Northstar V8 Current Smog!! VIN: 1G6KD54Y22U286152 Mileage: 109,063 Cold A/C! Power seats, mirrors, and windows. Leather interior. Cruise control and steering wheel controls. You've been outbid by e****5! by YOU! 1999 Toyota Camry CURRENT SMOG!! SEE VIDEO!! Estimated DMV Registration: $211 and $70 doc fees. CA title in hand. You've been outbid by M****h! by YOU! 1989 Toyota Camry 4 Door Blue, Only 46,285 Original Miles!, Power Windows and Locks. 1998 Mazda Protege Red, Dealer or Out of State Only!! Yamaha 48 Volt Electric Golf Cart with Dump Bed, Running See Video! GTX 30-D Tomcat Sweeper, with Batteries, Economy mode, made in U.S.A.